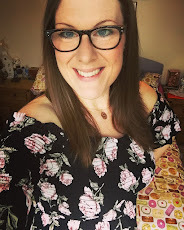 Cornish Daisy is a beautiful company created by Kate who lives in Cornwall with her gorgeous family. 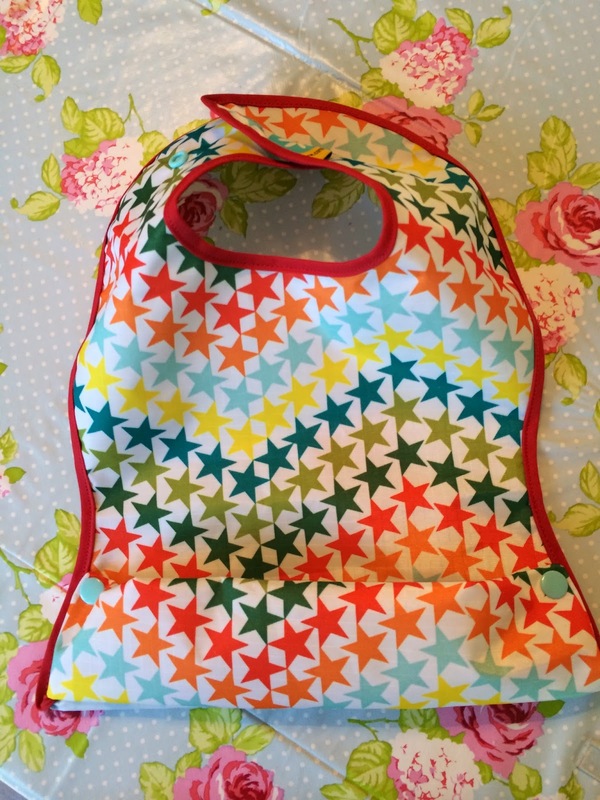 She originally began creating these bibs at home for her baby daughter, and am pleased to say she still lovingly hand makes these bibs today (just on bigger industrial sewing machines rather than tiny ones!) to sell to the likes of you and me! 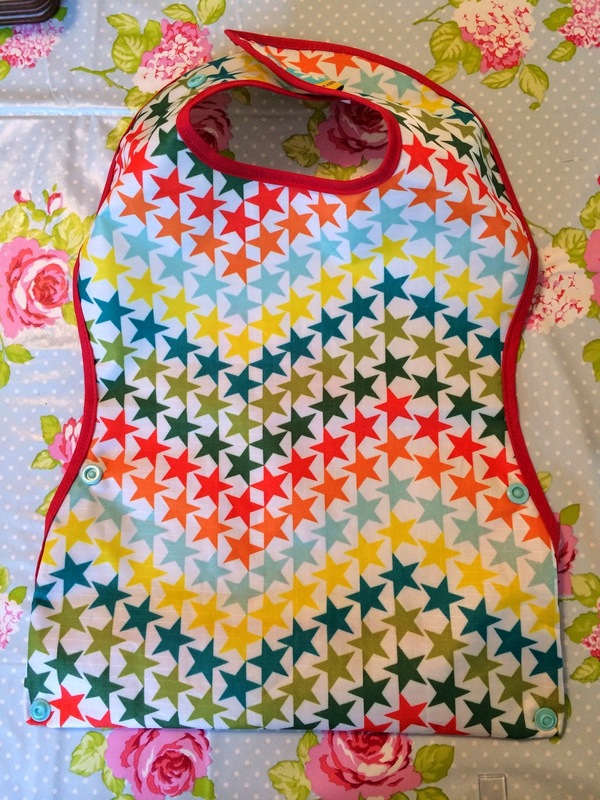 Kate sent me one of her Pod Bibs to review here on the blog, thanks Kate! The pod bibs are priced at £9.99. 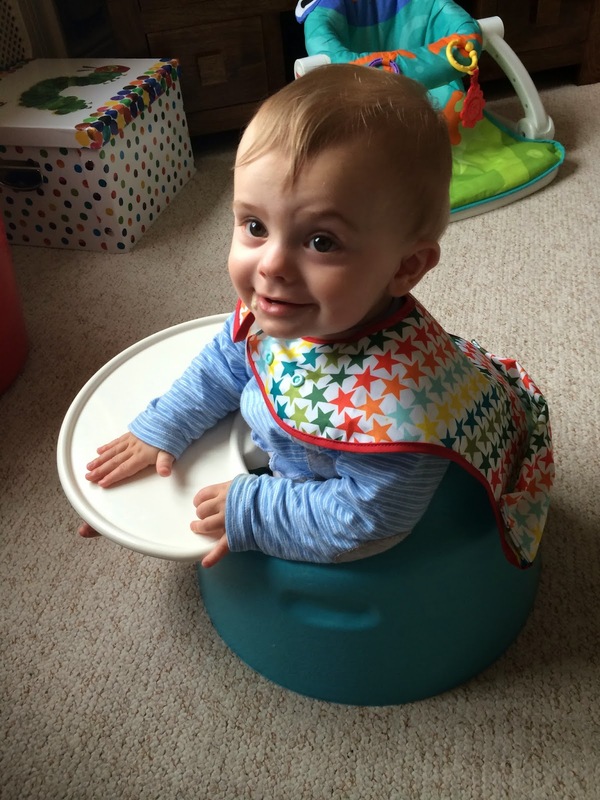 It's an ideal 'catch all' bib to suit baby's every need - the bright/fun design is eye catching and stimulating for baby, and its soft fabric feels great against baby's delicate skin. 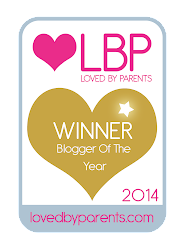 From a parents perspective I love the fact that their are three alternative popper fastenings to the neck which means the bib will grow as baby grows, and you won't be needing the next size up in five minutes time as with most baby garments! 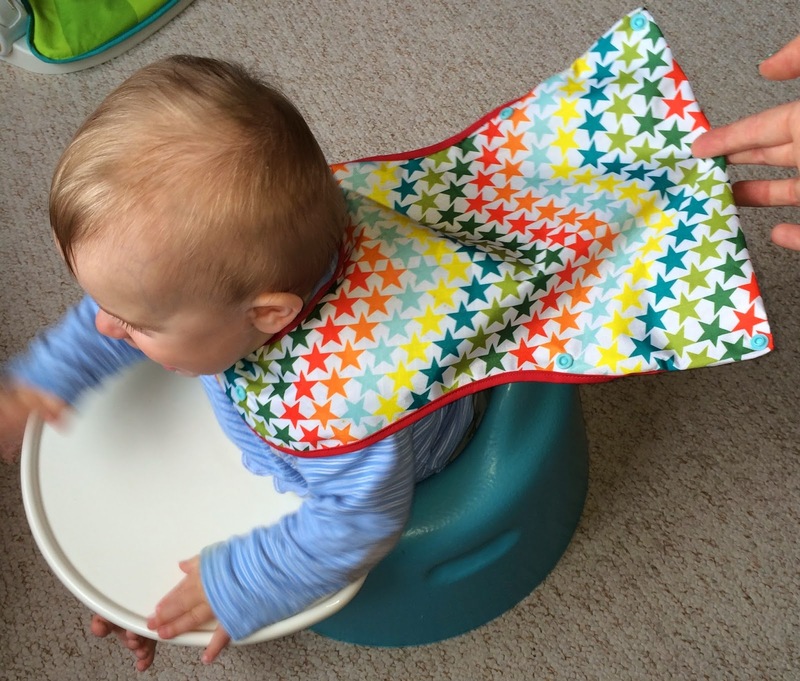 The bib also comes complete with a popper up 'pod' to catch all of baby's spills & spits when poppered up, and when un-poppered it is so easy to clean up all the caught food - no digging around in corners of the crease to wipe away the food, and no bibs going a bit manky where they haven't quite been wiped out properly! When unfolded the pod on the bib also covers more of baby's clothes for when they're wearing something particularly precious that you don't want splattered with baby food. Fab! Kate really has tried to think of everything with this design. I think the quality, beautiful design and fabric choices available at Cornish Daisy makes their products really great gift choices. Although perhaps deemed expensive for one bib, it really will last you for as long as your baby will need to wear a bib. 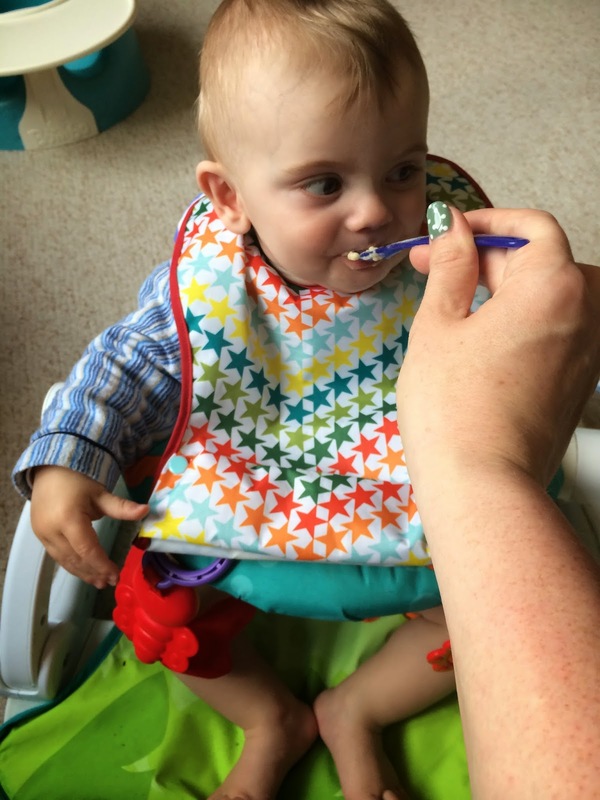 You are paying for quality, comfort and the fact that this bib has been lovingly handmade in the UK, not in some factory in China! If you were to purchase a few of these so that you could have some in the wash and some clean, it really would be all you need. 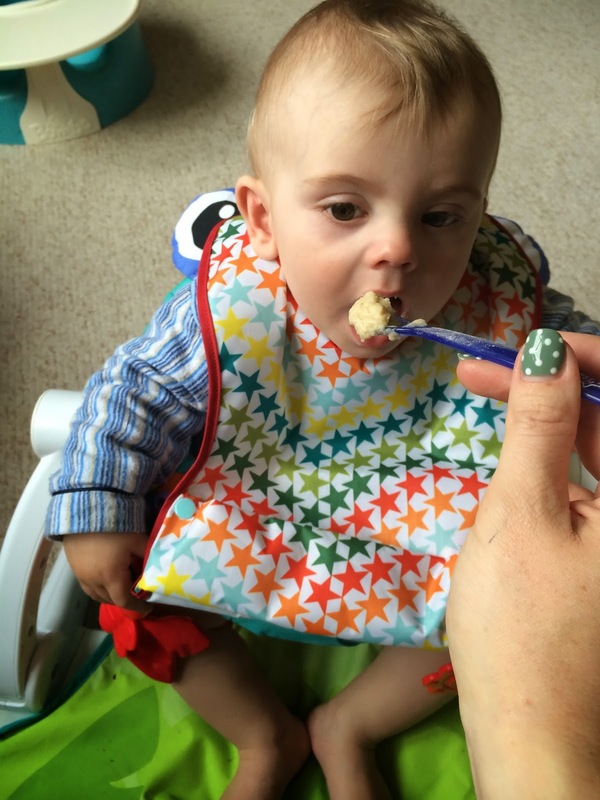 Here's The B Man wearing his Cornish Daisy Pod bib, enjoying his banana porridge sans trousers as there'd been a slight nappy explosion just before breakfast - oops! "Yummy porridge mum! 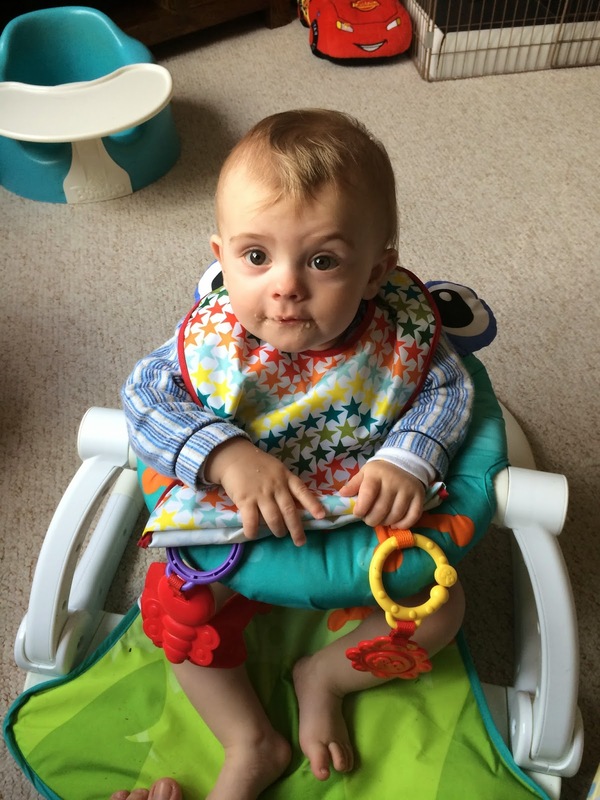 Does this new bib mean I can play my spitting out/blowing raspberries game?" Errr…No Bert! You can follow Cornish Daisy on Facebook here. Or order through their website here. Bye for now lovelies and hope you're all having a productive and happy week. Love it. looks so much nicer than those plastic pelican bibs, that I've stopped using because they just complain as soon as you put on on them! 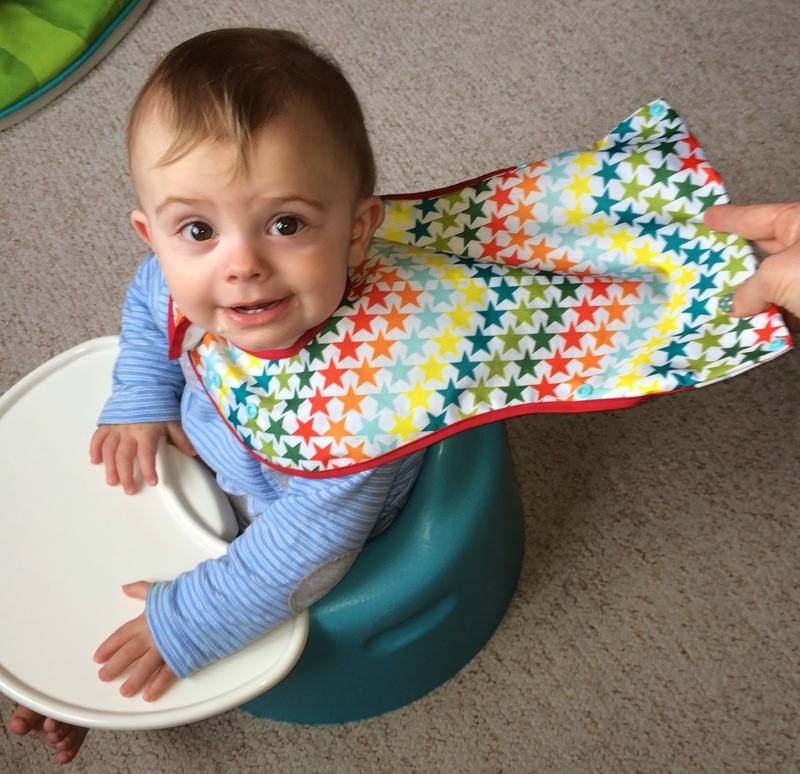 A bib that can be a perfect super-hero cape? This is really amazing! I definitely agree with the first comment that they are much nicer than plastic pelican bibs. Cute bib and adorable little guy!